I just never, ever tire of dreaming up junk garden planters or vignettes. 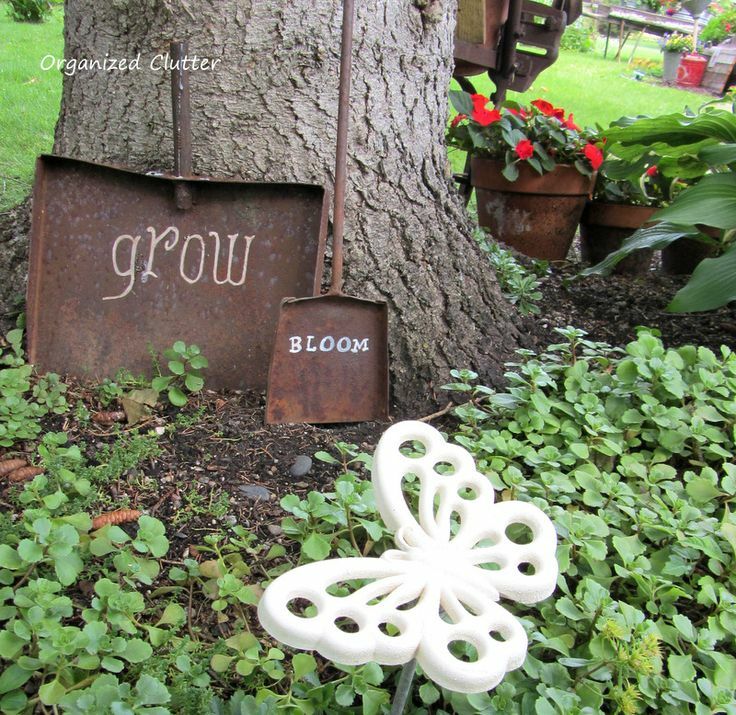 Here are some ideas I used in my 2014 junk gardens! Pansies in a half barrel vignette on the deck here. My Junkin' Friend Jodi gave me the cutest little rustic table. 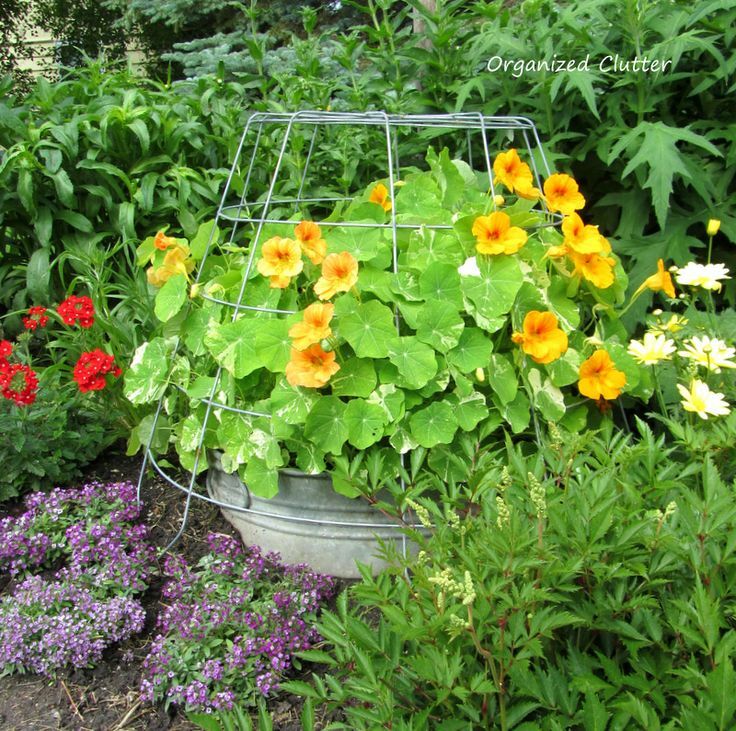 A galvanized tool box planted with coleus sits on top. I used an old chippy white picket fence as a rustic backdrop for my garden junk goodies along one side of the house last summer! This large wire basket was a great junking find! I turned it upside down and used it as a wire cloche over a tub of nasturiums. I also shared my sister in law's wonderful island garden bed with a fun junk path here. I decorated an old chippy barn door in my yard with old pot lids. 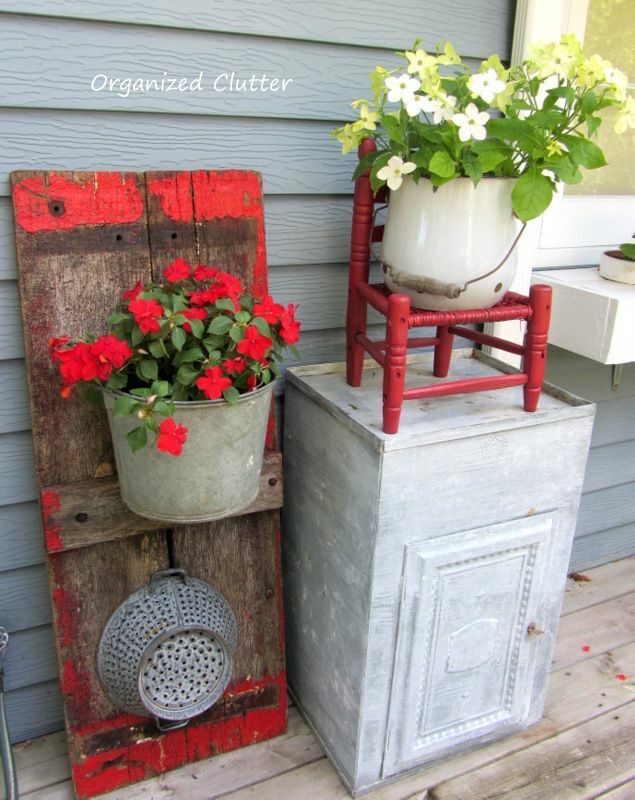 A very weathered hunk of wood from a wagon buckboard and a bucket made a fun rustic planter for some red impatiens. 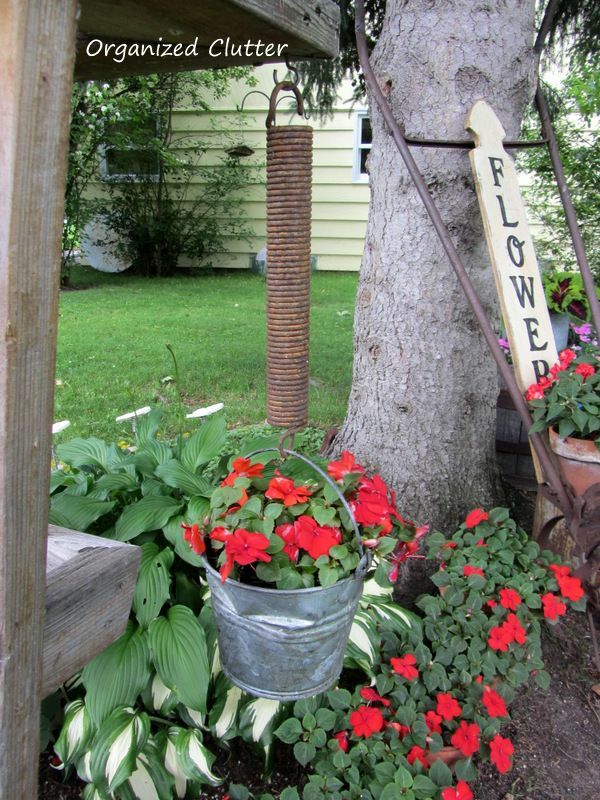 An old rusty industrial spring added interest to a pail of impatiens. Hens and chicks planted in a milk can top decorated the front row of my flower border. Rusty shovels made fun signs in my sedum bed here. Easy sign transfer technique. 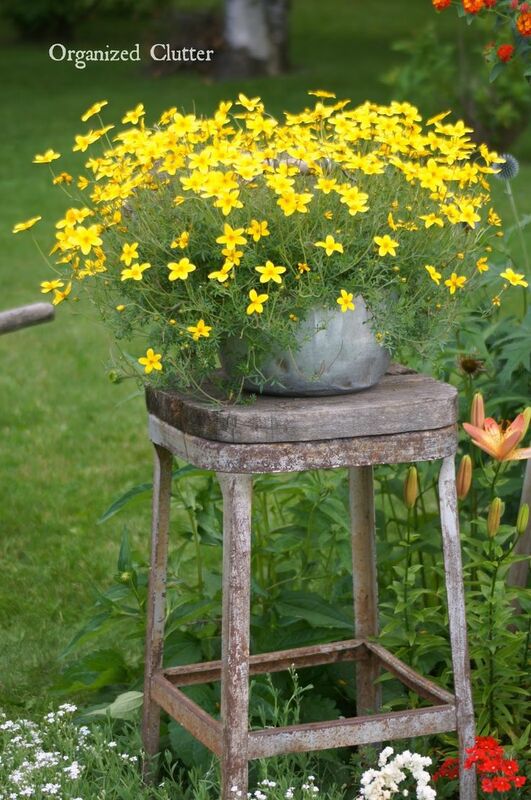 This super weathered old stool was one of my favorite junk garden finds of 2014! A yellow Bidens is planted in an old kettle and placed on top. 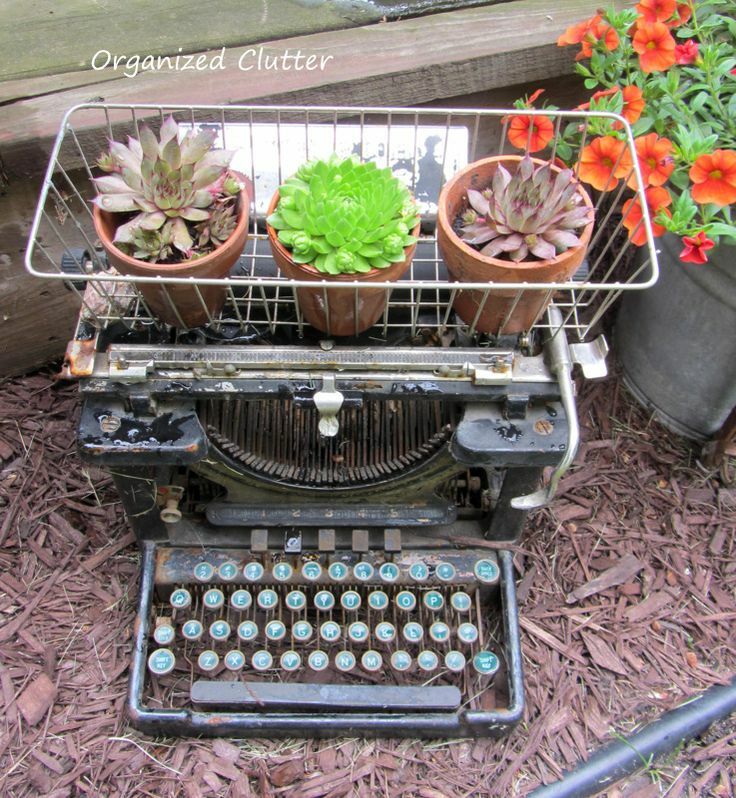 This old typewriter I picked up for $10 thrifting was a fun junk garden addition in 2014. 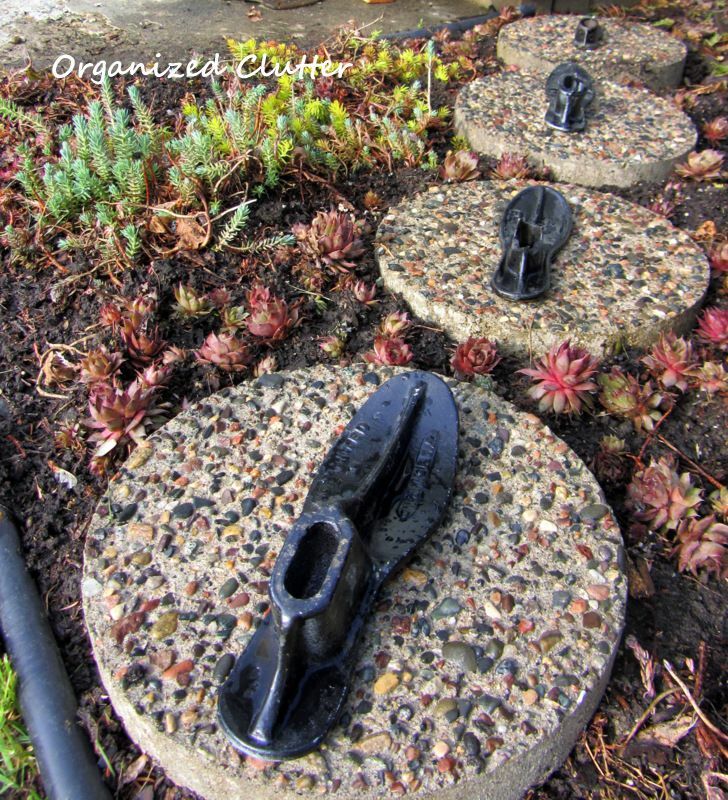 Iron shoe lasts on stepping stones decorated another succulent bed. While Heavenly Blue morning glories bloomed on the railing of my deck, a weathered wood bench and lots of galvanized junk garden items created a heavenly rustic vignette. A little fixing and re-enforcing, and I had a great free planter made from a dilapidated ice cream freezer. I planted a lobelia in a $5 wood box. I made a planter table from a $2 rummage sale find here. An old iron horse shoe games adds some fun to a bed with perennials. Annuals in washtubs in an old wheelbarrow are always a beautiful vignette. Along one side of the deck I planted succulents in terracotta with pulleys and gears. An ice cream freezer bucket painted in red and distressed, along with a red white and blue license plate, worked out well for the 4th of July. This is my 2014 front yard flower border on planting day. A complete planting diagram is here. AND this is my 2014 flower border in full bloom! 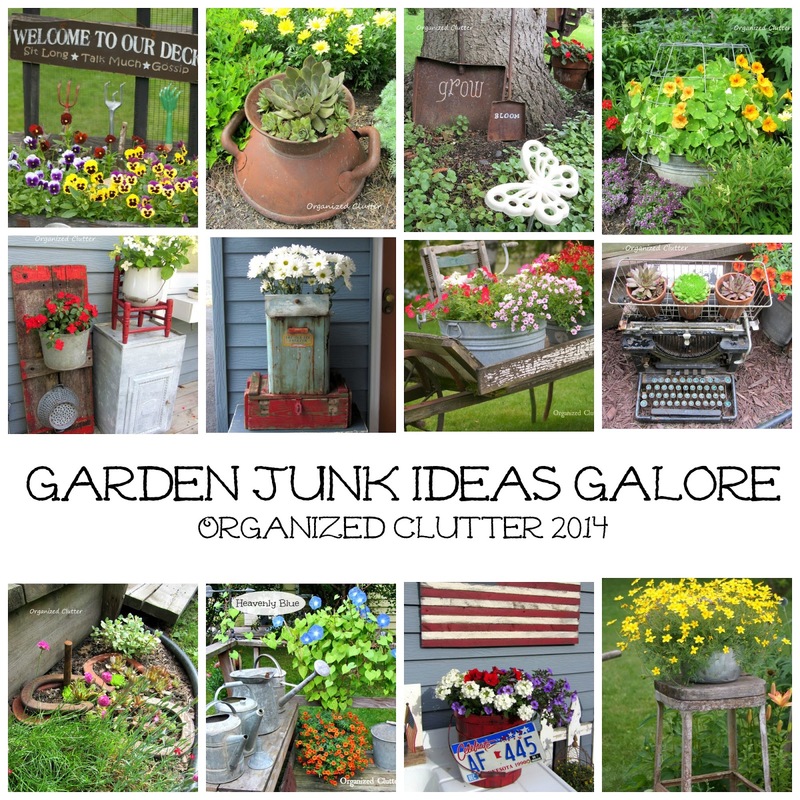 I can't wait to start on 2015's junk gardens! Wow. These vignettes are all cheerful and creative. 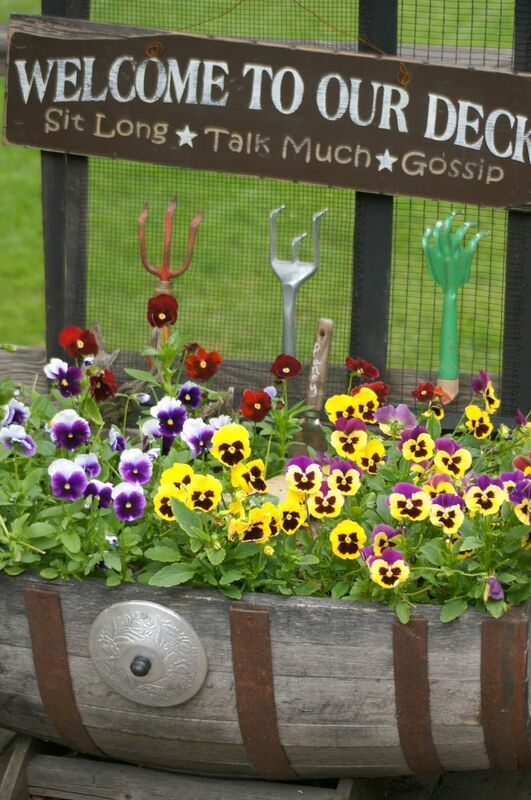 I like the horseshoes, and that first photo with the deck sign and pansies. I'm so inspired and waiting patiently for spring! Love your ideas Carlene, especially the shoes on the stepping stones. Love all your garden vignettes. Waiting to see what 2015 brings! 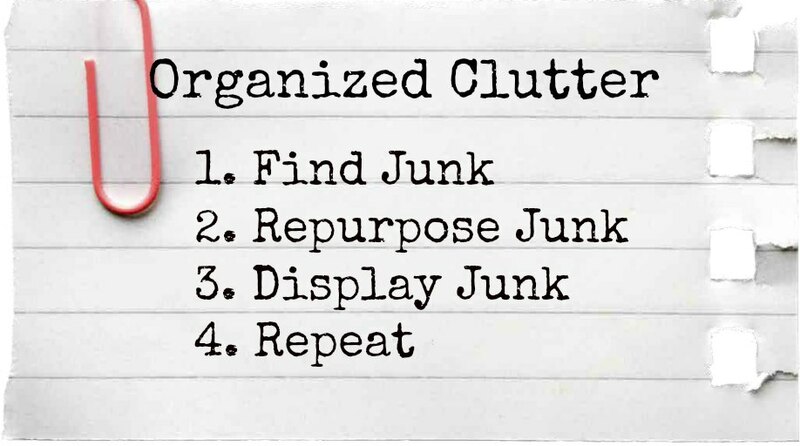 Happy New Year and Happy Junkin!! You have the greatest junk!! Can't wait to see what 2015 brings. Fabulous as always Carlene! Can't see what fun things you do this year. Happy, Happy! Love all your fabulous garden junk Carlene. Beautiful vignettes! Love it all--the walkway is my favorite! 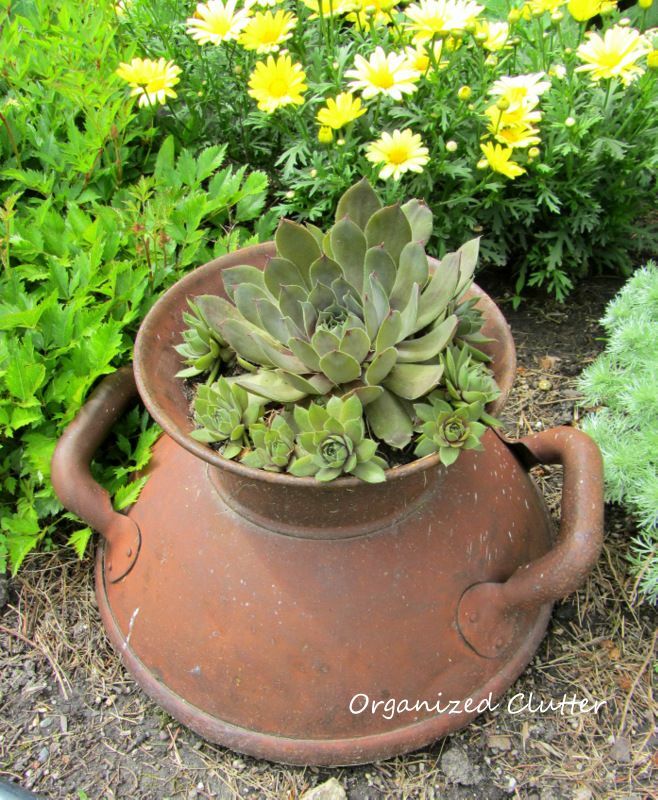 No one does garden junk like you--thanks for linking up!